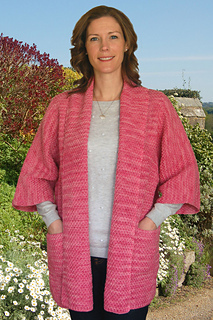 This one piece, top-down jacket with a turned back collar and 2 optional pockets has a very easy 2-stitch, 4-row moss stitch pattern. 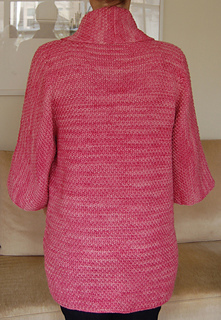 The back and sleeve back are worked together, as are right and left front and sleeve front. Shoulder shaping is worked as vertical decreases. 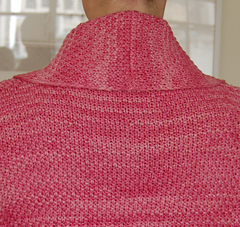 Cuff and collar edges have a slip stitch trim, and hem is k1, p1 rib. 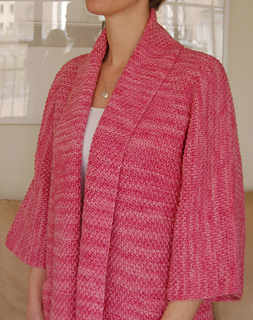 This jacket is intended to be oversized to cover various layering underneath.